This tutorial covers features of the provided AZRI character rig. Once completed the reader should have a grasp of all the functionality of the AZRI rig. Before doing anything, we’re going to reference the character into a clean scene rather than just load it. This ensures the scene contains only animation data with the rig itself remaining elsewhere, preventing us from breaking the rig and allowing us to easily update multiple animation scenes by adjusting only the original rig file if/when required. Open the Reference Editor (Maya Menu: File → Reference Editor). Create a reference (Reference Editor Menu: File → Create Reference). Navigate to the AZRI rig file on your computer, and hit Open. With the rig referenced in at real-world dimensions, it is required to work in units of meters rather than Maya’s default centimeters. Also, regardless of whether a game releases at 30 or 60 frames-per-second, we animate at 30 fps. As such, we must set the working units for the scene. Open up the preferences window (Maya Menu: Windows → Settings/Preferences → Preferences) and under the Settings category set Linear to centimeter. Still in Settings, set Time to 30 fps. Under the Time Slider category, set Framerate to 30 fps if not already set. Still in Time Slider, set Playback speed to 30 fps x 1 to play animations back at 30 frames per second. Make sure and hit Save to exit in order to save the settings for all future maya sessions. You can adjust a variety of display settings in the Preferences window, and can access it quickly via the orange icon in the bottom right of the maya screen. 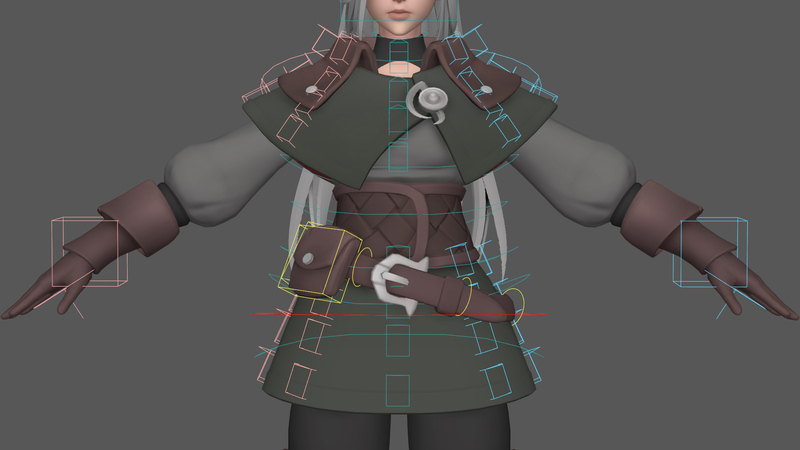 Click the the V (Visibility) in the Mesh layer to see how it turns her mesh on and off. Try each other layer to view it’s contents. Click the P (Playback) on the Ctrl layer and note how the controls hide when playing animation via the Play button in the lower right of the screen. Finally, cycle through T, R & blank options on the Mesh layer to see each display option. R leaves the contents un-selectable so you don’t accidentally select the mesh while animating. 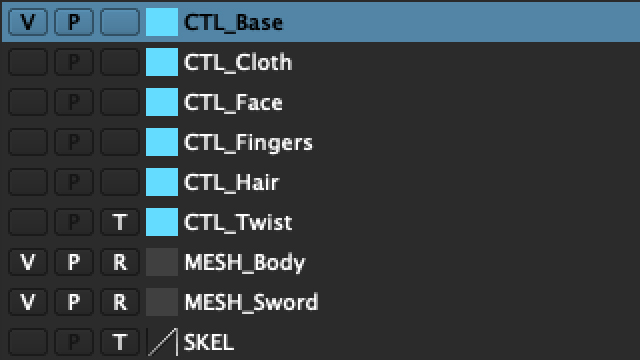 It is recommended to work with only the master controls (CTL_Base) and meshes (MESH_Body & MESH_Sword) visible when animating, turning on the others as needed for polish later. The large yellow circle control (CTL_C_World1) at the base of AZRI’s feet is the World control. This repositions the entire character rig at once. The red control (CTL_C_Root1) around her waist is the Root control, this controls her main body mass, and as it affects all other body-parts is a key control. 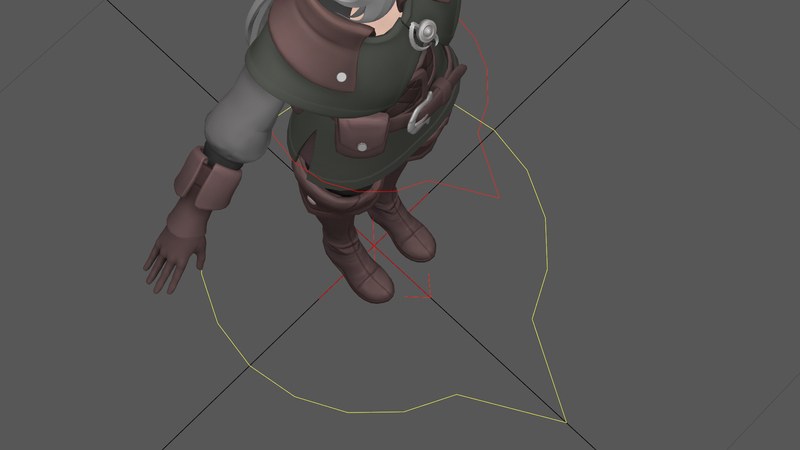 The red arrow between her feet (CTL_C_Collision1) determines her Collision (place in the game world). If you animate her away from the scene origin (centre) this must move with her so the game knows where she is in 3D space, and will become important only when exporting to the game engine. All four limbs can be set to be animated in either FK (forward kinematics – driven by the top control such as the shoulder) or IK (inverse kinematics – driven by the bottom control such as the wrist). The default is arms in FK and lead in IK as the arms are generally free whereas the legs are often planted on the ground. Select the circular left shoulder FK control (CTL_L_ShoulderFk1) and rotate the arm upwards. Note how the arm rotates the forearm and wrist with it, allowing you to create a an arc with the hand. In the Channel Box, change the value Ik Fk from 0 to 1 by typing, or by selecting the value then middle-mouse-button clicking and dragging left or right. The arm moves back down to a newly appeared box control – the left hand IK control (CTL_L_HandIk1). Move and rotate the box-like IK control (CTL_L_HandIk1). 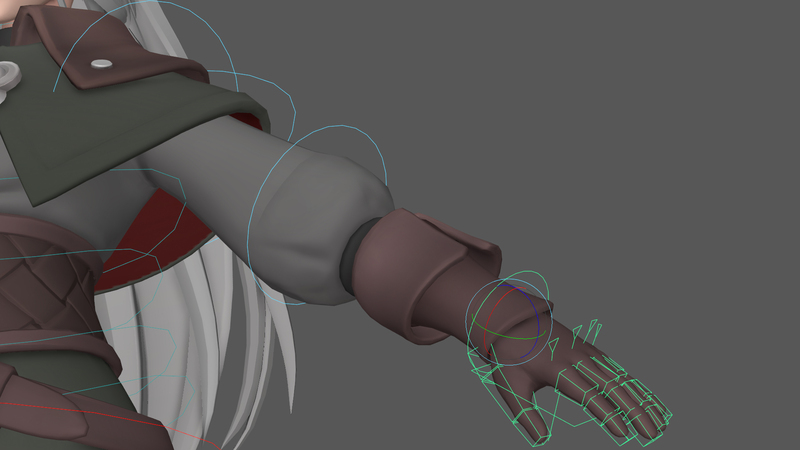 Now the shoulder and forearm rotate to match the hand. Move the Root control (CTL_C_Root1) and note how the hand remains in place rather than move with the rest of the character, just like the feet. FK is generally used for limbs free to move in space so as to create nice arcing movements for animation, whereas IK is instead used to ensure the hands or feet lock to a position in space. You can animate between IK and FK by keying the Ik Fk value between 0 and 1. The AZRI Rig contains automatically-moving joints to move her cloth over her skin. These joints, hidden on the AZRI:Cloth display layer can be additionally animated to overcome mesh interpenetrations not solved by the automatic movement. In the Layer Editor, make the cloth controls visible by enabling V (visibility) in the leftmost box next to Cloth. Manipulate the cloth controls’ position and orientation to match your character’s pose to eliminate interpenetration.